A career as a Legal Nurse may be a great option for any Nurse who is ready for a change. "A Legal Nurse Consultant is a nurse who uses their medical expertise to review, interpret, and analyze medical records in legal cases." A Legal Nurse Consultant is a nurse who uses their medical expertise to review, interpret, and analyze medical records in legal cases. Because most members of the legal community do not have a medical background, these members of the legal industry are incredibly misinformed when it comes to medical care and standards. The need is higher than ever for medical professionals who can work with the legal industry to show them exactly when medical negligence is present, and what damages have resulted. There is no better medical professional for this role than the nurse. Since Nurses are typically responsible for maintaining the medical records, and since they are trained extensively on medical standards of practice and work to adhere to them on a daily basis, there is no better medical professional to analyze and interpret medical records in legal cases. Where can Legal Nurse Consultants Work? "You can find a job as an 'In-House' Legal Nurse or you can start your own Independent Legal Nurse Consulting Practice." When starting as a Legal Nurse Consultant, you get to choose between the following career paths: you can find a job as an "In-House" Legal Nurse or you can start your own Independent Legal Nurse Consulting Practice. As an In-House Legal Nurse, you will work full or part time in a law firm, insurance company, managed care organization, or any other organization in need of medical record review. As an Independent Legal Nurse Consultant, you work on your own to secure cases and get paid on a consulting hourly basis. Working as an Independent Legal Nurse Consultant is the best option for most Nurses because it pays better, allows more flexibility with work hours, and allows them to be their own boss. However, some Nurses prefer the stability of a full-time or part-time job. What kind of Salary do Legal Nurse Consultants Make? "In-house Legal Nurses typically earn a pay of $20-$60 per hour. Independent Legal Nurse Consultants typically earn $125-$200 per hour, and $300-$500 per hour to testify." There are two main Legal Nurse Consulting Salary options. In-house Legal Nurses typically earn a pay of $20-$60 per hour. Depending on the organization where they work and the number of hours they work, benefits may be available as well. Independently practicing Legal Nurse Consultants typically earn $125-$200 per hour, and $300-$500 per hour to testify as an Expert Witness (if they desire to do so). Independent Legal Nurse Consultants may have to work a little harder in the beginning to establish their clientele. Once that is done, only a few attorneys are necessary to provide a full case load. Since Nurses are utilizing medical expertise that they already possess, additional training or certification is not required to practice as a Legal Nurse Consultant. However, it is recommended to become certified because most Nurses are unfamiliar with the legal process, how to market effectively to find cases, and how to create an impressive Legal Nurse report. There are two types of training that you can complete: a certificate and a certification. A certificate course is one that offers basic information at a beginner level. Many universities offer this type of training. A certification includes more detailed training and requires you to maintain the certification by meeting certain standards of conduct and completing continuing education to keep your knowledge up-to-date. "It is important for you to know that all Legal Nurse training and certifications are NOT the same." It is important for you to know that all Legal Nurse training and certifications are NOT the same. Despite what some organizations may tell you, there is no board or governing body for Legal Nurse Consulting. Any claimed accreditations are unrelated to Legal Nurse Consulting and will not make a difference in your success or the quality of your training. Each organization is responsible for upholding the standards of their certification. When choosing which Legal Nurse training is right for you, you want to make sure that you take the time to compare organizations and options. Many different promises and claims will be made. However, the only true indication of the quality and effectiveness of an organization's training is it's success rate. That is what matters. What percentage of graduates who utilize their training are able to secure cases and make money. After all, if the training included in a certification does not give you all the tools you need to succeed as a Legal Nurse, then it is just a waste of money. 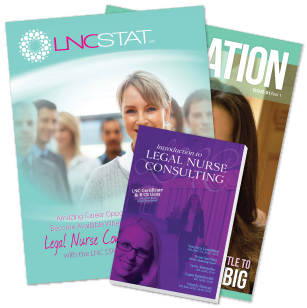 Click the button below to learn more about the LNC STAT course, and see why it may be your best option when becoming a Legal Nurse.